The Hero -- (lead singer) The leader of the group. Can be clean-cut and upstanding, bold and charismatic, serious and driven, or some combination of the three. The Lancer -- (lead guitar) The second-in-command, usually a contrast to The Hero. If the Hero is clean-cut and/or uptight, the Lancer is a grizzled Anti-Hero or Deadpan Snarker; if the Hero is driven and somewhat amoral, the Lancer is more relaxed and level-headed. The Smart Guy -- (keyboardist) The physically weak, but intelligent or clever member. Often nerdy and awkward played for comic relief. Sometimes unconventionally young (early- to mid-teens). Sometimes a trickster and a buddy of the Big Guy. May be the one with all the "street" connections. The Big Guy -- (drummer) The strongman of the team. May be dumb. Or mute. The Chick -- (vocal effects, tambourine) A peacekeeping role to balance out the other members' aggression, bringing them to a nice or at least manageable medium. The Chick is often considered The Heart of the group. Not always female, but the role is usually taken by the Token Girl (hence the name). Sometimes referred to as "the useless girl". The Medic—Generally either The Chick or The Smart Guy, or a combination of the two; more likely to be The Smart Guy the further up the Mohs Scale of Sci Fi Hardness you go. Mentors—The wise advisory type who comes and goes. Potentially organizes the team, trains them to be an effective group, and/or has a personal connection with the Big Bad. They might be killed to give the group someone to rally around. Sixth Ranger—A johnny-come-lately addition to the team, often an outrider type who has been lurking on the edges of the action from the beginning. Their addition to the Five-Man Band usually shakes up the status quo. Has a tendency to be a defector from the bad guys. Sometimes the Ensemble Darkhorse. Tagalong Kid—Usually the Hero's or the Chick's younger sibling. Gets to save the day about once per season, thus generating about a 1:63 ratio of "being useful" to "getting kidnapped." The Team Pet—The dog, cute alien, or Robot Buddy. Might occasionally enable plots, but not really a character in the conventional sense. Note: Variations occur where the core five are different or overlap. Don't take the title too literally—it's the roles more than the numbers that matter. See also Three Amigos, Power Trio, and Cast Calculus. Fighting ability is usually determined by Distribution of Ninjutsu. Contrast with the Five-Bad Band. The Psycho Rangers are the collective Evil Counterpart of a given Five-Man Band. Compare the Command Roster, for military-esque teams. Color-Coded for Your Convenience — If they have uniforms or similar outfits, members will have different colors to help tell them apart. Usually The Hero wears red and The Chick wears pink; other members are more variable, although the Lancer often wears blue. Five-Token Band — When everyone is a different ethnicity. This can sometimes literally be a musical group. Characters can also be divided by personality instead of function: See Four-Temperament Ensemble. The subpages list examples of teams that fit at least four of the character tropes. 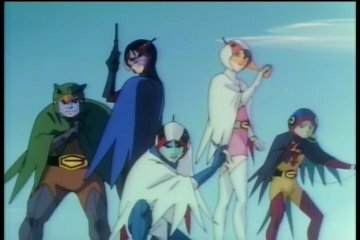 Remember that they form a team dynamic; it's always tempting to match two of the characters in a show, then try to convince yourself and others that the other characters can be squeezed/wedged/stuffed into the description of the other character types, but that's not the point of the Five-Man Band trope. The individual character types exist outside of the band. The Five-Man Band only occurs when the team as a whole fits, not just a few characters. As a rule of thumb, if your band example has to justify more than two types, or a single trope with more than two sentences of qualifiers, you're trying to pull a fast one. If it isn't a Five-Man Band, it isn't a Five-Man Band. Pages in category "Five-Man Band"
Media in category "Five-Man Band"
This page was last edited on 10 April 2017, at 05:48.